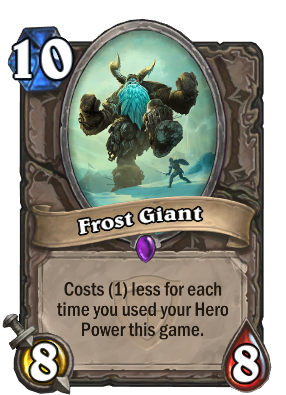 That is what I was going to post: in Even decks, Inspire minions and Frost Giant are making quite the comeback (for me at least). Love it then, love it Even more now. Ha. And yes, emoting was vital. Perhaps the funniest golden animation.. I'm currently trying to work this into a deck with Sir Finley for some fun shenanigans! I love control warrior but don't have much of a collection to be able to play that deck archetype efficiently, so I often look at other people playing control warrior... and I never, ever seen them play this card. I wonder why? Seems solid in it. Ultimate Infestation as Neutral spell or RIOOOOOOOOOOOOT!!!!!!!!!!!!!!!!!!!!!!! Love it for token Paladin. You very suddenly go from soldiers fighting for their home, to worshipers fighting for their overlord. Such a big - and cold - giant. So very cold. I tried making this work in Priest. Not great. I really want to find a deck to put these in. I feel like this card is overlooked way too often.